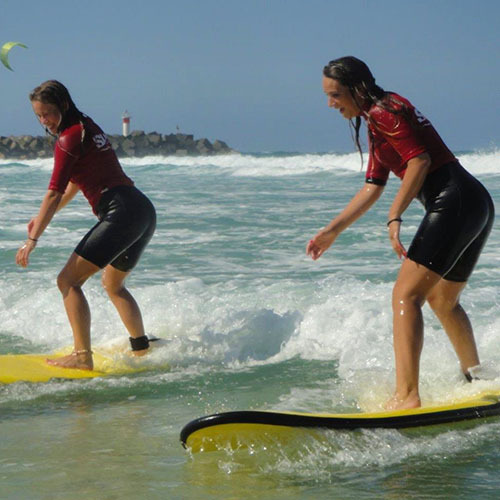 Our surf school is located on the beautiful Gold Coast and only 10 mins from Surfers Paradise at “The Spit” which has a break wall which offers protection from the stronger sweeps and allows for the formation of perfect sandbanks which create ideal waves for beginner surf lessons. It’s the beginner Surfers Paradise! With only a maximum of only 5 other people in your surf lesson we find we can give you a much better surf lesson where not only will you be safer, get more individual help and have more success but you will also have more fun! This is the lowest student to coach ratio of any Gold Coast surf school. With over 10 years of experience you get the best instructors teaching you the best techniques using the best equipment in the best location. We guarantee you will stand in your first surf lesson or we will give you a second lesson for free! We are not going to put you in a group of 20 and yell at you like a military sergeant. We have designed our surf lessons to be fun and enjoyable and we want you to be able experience the thrill of surfing a wave! We believe the best surfer is the one having the most fun! A private surf lesson from only $80 will help you progress at a faster rate, getting help and advice to help your own individual ability level and needs. A group surf lesson from only $55 for a 2 hour lesson is a great introduction for someone wanting to get a taste of surfing for the first time at a minimum cost and with only an average of 3 other people in your lesson your going to be safer, improve faster and have more fun! We have 3 or 5 group surf lesson packages and if surfing is something you would like to get into then this is for you. Not only are they great value from only $41 per lesson but you can also use the lessons whenever it suits you. 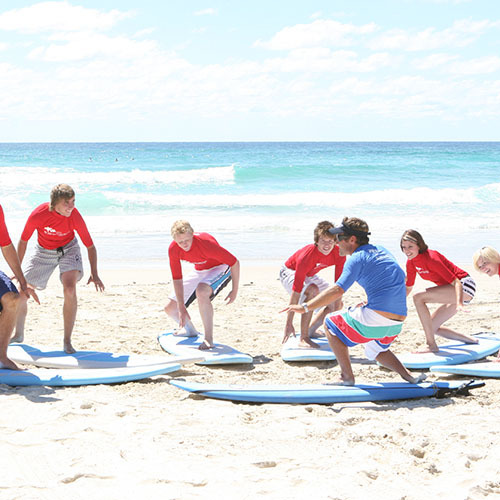 We can customise a surf lesson to incorporate more focus on either surf safety, team building activities, beach education or whatever suits your particular student group no matter how big or small. Discounts for groups of 6 or more available. For all our surf lessons bookings are essential!